mundane jane: Call it what you want; it's a book review. Call it what you want; it's a book review. For the first time in a long time, I spent all of the past Saturday with my nose in a book. I took Scott Sigler's The Infected: A Novel with me to the family luxury vacation condo. Once there, I cracked it open and was instantly hooked. I toted it from room to room. I read on the back deck, on the sofa, and in the hot tub. I stood with it in the kitchen as I microwaved my lunch and read it instead of having a nap on Saturday afternoon. I've not read with such single-mindedness since studying for comps. And yet, I just can't recommend this book. No one is more surprised than I. Author Scott Sigler has a fairly large Internet following; in fact, his previous work was published exclusively via podcast. While I'd not read listened to his work before, I knew he was out there and that he enjoyed a measure of respect from folks who had. Ultimately, I was convinced by Amazon reader ratings averaging four-and-a-half stars and positive reviews from both the Dallas Morning News and Publishers Weekly (among others). The premise: a mysterious disease of unknown origin is causing everyday Americans to run amok, torturing and killing friends and family members before killing themselves. Leading the effort to diagnose and contain the contagion is CDC agent Margaret Montoya. On the ground, the CIA's Dew Phillips is tasked with finding and capturing someone with the disease. 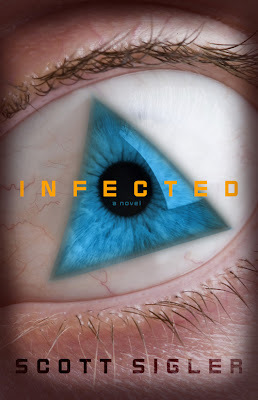 By the time the reader discovers that the illness is actually a bio-engineered parasite, ex-college-football-star-turned-IT-worker Perry Dawsey becomes one of the infected. I don't think I've ever encountered a book that so compelled me to finish reading, while simultaneously reminding me of the author's lack of artistry. While not exactly novel, there's enough promise in the premise to prompt me to spend my money. I wish I could say as much for the character development and quality of writing. What a disappointment. Sigler's been at this long enough by now to have developed better chops. I knew before looking him up that Sigler was a Stephen King fan, because I could see it in the dialogue. And he's really good at imitation-King dialog (No bout adout it), as opposed to King-influenced dialog. More than this, though, he lacks King's ability to flesh-out characters--particularly female ones. And ultimately, I think that's where Sigler lost me. If a novel can be said to be masculine in nature (and I think it can), then this is a manly book. Indeed, the most horrifying portions seem designed to particularly terrify male readers. And I'll wager that they do. If Sigler really does want his work to be held in the same esteem as King's, though, he's going to have to find a way to scare the rest of us. Making us understand and care about the central characters would be a good start. Until he can do that, he should probably stick to free downloads. I felt the same way about Twilight. I finished the novel, the whole time shocked by how much the writing sucked. There is a certain talent to that though. So you were instantly hooked, carried it around the house, read it cover-to-cover, thought it was compelling, yet it lacks artistry and "chops?" That's got to be the best negative book review I've ever received. Thanks for buying it and I hope I get a chance to win your business back with the sequel, CONTAGIOUS. While your recommendation to "stick to free downloads" is noted, I'll just go ahead and keep publishing print novels in addition to giving everything away for free. Ok, Deb... So freakin' cool.